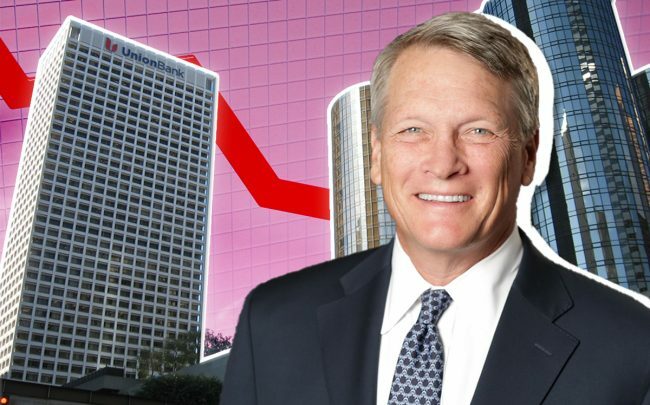 Union Bank is close to completing a deal that would sharply reduce its space at Union Bank Plaza in Downtown Los Angeles, The Real Deal has learned. The bank, an anchor tenant at the high-rise for five decades, will vacate 136,000 square feet, sources said. The bank occupied 344,000 square feet at the 40-story tower in early 2018. The firm has shed some space in the past year though the amount was unclear, a source added. Recently released marketing materials for the property at 445 S. Figueroa Street reveal Union Bank is vacating floors 2 through 9. Justin Collins of Cushman & Wakefield is the listing agent with Peter Collins and Kelli Snyder. A representative for Union Bank said that, though the bank has been a “mainstay” at the tower, it periodically “shifts colleagues within the building to bring teams closer together.” He declined to comment on the firm’s total square footage there or its decision to vacate those floors. The owner of Union Bank Plaza — KBS Real Estate Investment Trust II — has been struggling to sell the massive property. Roughly two years ago, RC Acquisitions backed away from its $280 million deal to purchase the 627,000-square-foot site, plus its 2-acre developable parcel. In a shareholder meeting a few months after the deal fell through, Newport Beach-based KBS also said the appraised value of the property had dropped about $52 million.